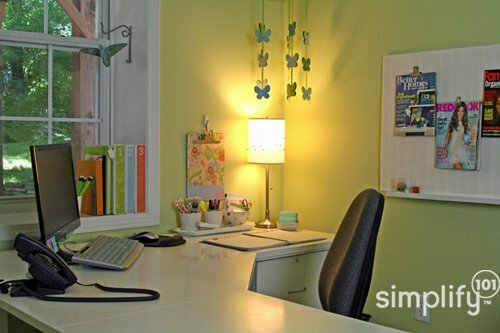 Last month I finished an organizing overhaul of my creative space (which also happens to be my simplify 101 office.) Want to take a little peak? Here are some photos of my space, along with 7 ideas for organizing your own craft room, scrapbook space, or home office. Hope you enjoy! Idea #1: Invest in a functional work desk. It just occurred to me that I spend more time sitting at my desk than I do lying in my bed! My desk (and desk chair) are the two pieces of furniture I use most…in my entire home! What a crazy realization. How about you? Does this ring true for you, too? If so then it really makes sense to invest in a desk that is comfortable and functional for you. If you are comfortable in the place where you work—or create—you’ll be more productive. To determine what type of desk would be most functional for you, think back to your favorite work area. This could be an office at a former or current job, or maybe the space you studied at in college. Once you have that space in mind, think about what made it work. What type of desk did you sit at? How accessible were the storage solutions? What type of storage solutions did you use? Then, translate these ideas into your current work area. …this approach will give you the best end result. Here’s why. When you empty your space, you let go of all preconceived notions about what belongs where. You create a blank slate which means you can completely reinvent your space and organize it so that it suits your current priorities. Most important, you become much more selective about what you bring back into your space. It is actually easier to let go of clutter—stuff you no longer use, need or love—when you empty your space while organizing. Idea #4: Maximize your storage space by going vertical. If your craft space is short on storage, do a quick visual check. Where do you have open vertical space that you could put to use? Consider adding bookcases or ladder shelving units to free floor space or add wall mounted shelves to open wall space. Idea #5: Consider a standing work area. When I originally set up and organized my creative space / office several years ago, I was intrigued by the idea of a standing work area for scrapbooking. I didn’t think I would enjoy standing up to scrapbook…but I sure did surprise myself! 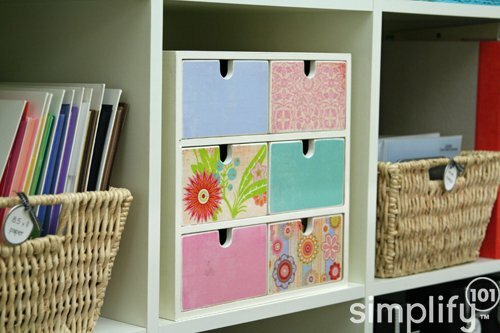 Standing up to scrapbook makes it easier to grab tools and supplies stored close by but not at your actual work area. I also love using this area for sorting and organizing paperwork for business projects. Standing up to create or sort paper energizes me…and keeps my blood (and creative juices) flowing. It’s also nice to have a secondary work area for myself (so I can keep my business desk clear of creative projects) and for visitors such as my kids when they’re working on school projects. 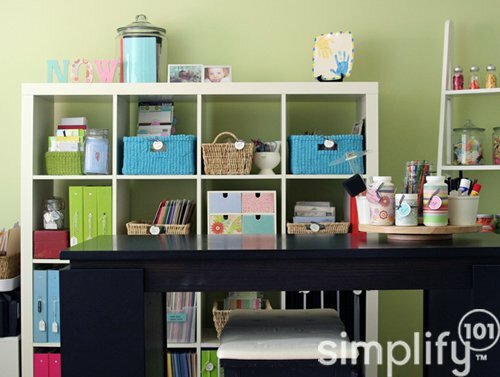 If your space and budget allows a standing work area in your craft room, give it serious consideration. You just might surprise yourself at how much you like it. Idea #6: Have fun with labeling. Adding labels to your space will help you keep things organized going forward because you’ll remember what belongs where. Function aside labels are a terrific way to make your space even more fun and inspiring. Create labels use using your favorite craft supplies. 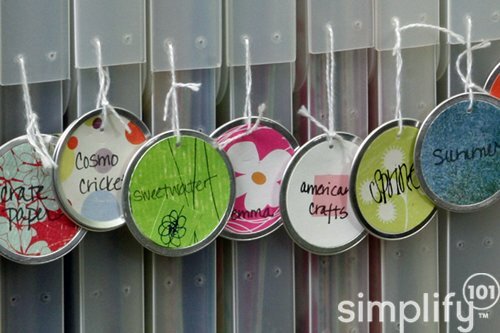 For example, these tags were made by punching circles out of scrapbook paper, and gluing them to a plain, white metal rimmed tag. Simple and fun! 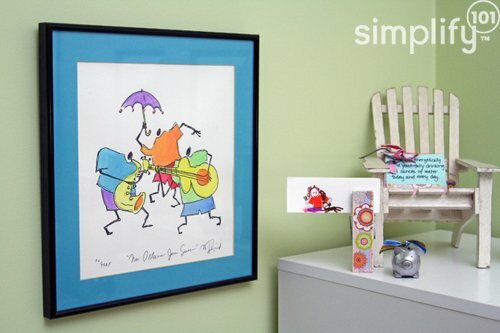 Idea #7: Infuse your space with personal touches. When all is said and done, our favorite spaces in our homes are ones that feel like us and look like us. They’re filled with items we love and items that inspire us. Look for every opportunity to infuse your craft room with personal touches via artwork, meaningful storage solutions, and decorative items. When you love how your space looks, you’ll want to spend time there, and even more important—you’ll be more motivated to keep it organized going forward. P.S. If you’d like more ideas like these and a step-by-step system for organizing your craft room, scrapbook space or creative studio, check out my self-paced online class. I love! Especially that your desk faces a window. I also like the labels. Very nice! I actually asked an age ago but can you PLEASE tell me where you buy those metal tags from and do they have a “technical” name? I love them. Thanks so much! we use those tags to label fabric bins at work, but they aren’t jazzed up with scrapbook paper that looks nice. The label tags etc are for sale at Staples in the Martha Stewart line – tons of organization ideas and containers as well. Thank you for your information Aby! Just popped over to your site and having fun looking around. My main craft is knitting (and crochet too), making it a bit hard to do the standing thing, lol. Storage tho, is always at a premium. I love the green on your walls. I see a lot of yellow and often blue in craft areas, but I think the green is more restful- yet- fun. What color did you use? Can you describe the desk a bit more? Brand? Details? @Laura, Thanks for your comments on the wall color. It’s Benjamin Moore Pale Sea Mist. I have been very happy with it. Very adorable stuffs. I’d like to have that also inside my room. Colorful and really beautiful. They sell the key tags at Home Depot!!! By the key cutting machine!! I love the way you set everything up and how neat and clean it is for a work space. Can you tell me once again the name of the paper holders you have the round tags on? I changed email addresses before and I no longer have that information. I know they are discontinued but I managed to find some before. Those paper holders were made by Making Memories. Glad you were able to find them before.